What has been a recurring theme in the commentary on this game, and will be laced throughout this piece, is Armagh’s defensive tactics. The effect of this can be seen in a number of areas and none more so than in Cavan’s 94% shot rate. In all bar two occasions when Cavan got the ball into Armagh’s 45 they got a shot off. 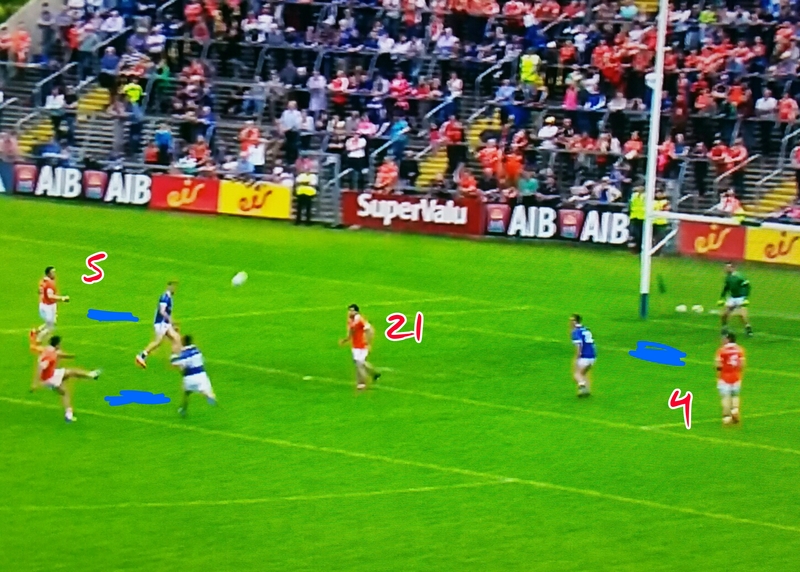 This is phenomenal and an indicator of the lack of pressure the Cavan forwards were under. They were rarely tackled by multiple defenders nor forced to spray the ball back and forth across the line looking for a gap. Armagh left lots of space; the ball was played into it, gathered and a shot taken. Cavan’s slightly below average weighting shows that, Dunne apart, their execution left a lot to be desired. Armagh did have their chances, with above average possession and shots, but their execution let them down. Dunne and Keating had 19 shots from play between them scoring 10 points. Dunne was a lot more efficient (73% Success Rate (8/11) & Weighting of +2.41) than Keating (25% (2/8) weighting of -1.87) however the supply to both really had to be shut down. Apart from Tony Kernan’s wonderful sideline point there was nothing of note here – except perhaps Dunne missing two very easy frees in the first half. Look at how close to goal all of Cavan’s shots are. 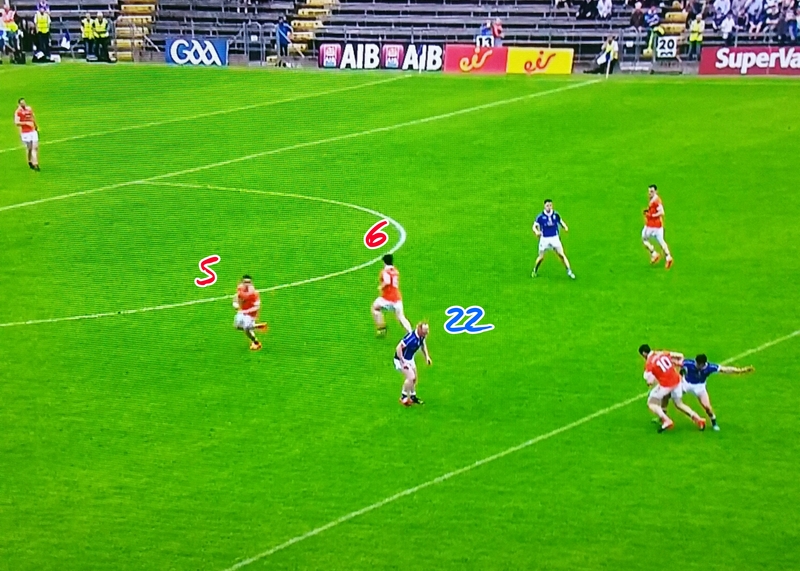 Armagh’s man marking ensured that there was no “press” on the ball – Cavan could just get the ball in, turn and shoot. Armagh, for all their failings, got the ball into the right area. They missed 6 shots from play from in and around Sector 5 – take the average from this sector and they are right there. It is quite instructive to compare the two shot charts here with Mayo’s against Galway (here) and compare the accuracy from in front of the posts. Armagh had a +9 differential on winning kickouts but only turned this into a +3 differential in terms of shots. This was due, in the main, to Cavan’s excellent shot rate – every kickout they turned into a possession also became a shot. Although on the surface a -3 differential on shots from kickouts won is not a bad days work this will be an area of concern for Cavan. They will surely not meet a defence as accommodating again. If they continue to win just 40% of kickouts we can expect the conversion to possessions, and then shots, to drop. Were this to happen it would provide a huge platform for their opponents. Eugene Keating had a bad day but he was stellar against Donegal last year (here). I think it is safe to assume that both he and Dunne will regress to the mean – if this does happen then Cavan will be looking for more production from the rest of the team. That’s an impressive line from Tyrone! Their possessions were quite low but what they did with them was wonderful. 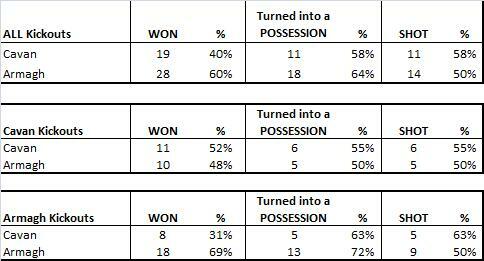 To get the average number of shots off whilst having 9 less possessions (against the average) illustrates the innate footballing ability they have but also, to an extent, the game plan they play to. They have the confidence to be patient – to let the opportunity come to them. Then when the opportunity does come they are lethal. The next best Success Rate we have in 2012, after Tyrone’s 68%, is Kerry’s 61% against Tipperaray when we showed they achieved this by shooting from in front of the posts (segments 5 & 8). Tyrone didn’t wait for such easy opportunities to open up. Although there is a high correlation between a high Success Rate & a high Expected Return if Tyrone were only popping over points from the 21m line they’d have a much lower Expected Return. They instead took the shot when the shot was on and scored more often than not – their decision making, aided by no little skill, was a joy to behold in this game. As an aside there is definitley something afoot with how teams are using the ball compared to 2010. We are getting fewer possessions and higher shot rates. It might be a function of the 2012 data to date having a higher percentage of plays from “weaker” counties than the 2010 data. Teams who do not have the footballers to break the defensive curtain are shuffling the ball back and forward across the 45m line before pulling the trigger after running out of ideas. If this is the case it will work itself out over the coming weeks as we get more “big” games but it is definitley something to keep an eye on. Again Tyrone’s shooting from play was exemplary. One has to wonder however if Armagh’s man marking, for all its entertainment value, was best served against this Tyrone team. When Tyrone face the likes of Donegal, Dublin or Kildare, who will pack the space in front of their goal with bodies, will that Success Rate hold up? If not they will have to up their volume of possessions to compensate for any slackening in the Success Rate. Armagh had the chances, despite the red card, to win this game. They had as many shots as Tyrone but just didn’t execute. Watching the game you felt that Jamie Clarke was taking too much on hoping for wonder scores. The below table shows that he was just above average in his returns and it was, in fact, the Armagh supporting cast that let them down (23% Success Rate on 13 shots with an Expected Return of -2.68. Terrible.). Armagh need to develop shooters alongside Clarke (much like Donie Shine & Roscommon) to escape the qualifiers shark pool.